Shaun Golden is the 76th Sheriff of Monmouth County and is the chief executive of the 605 member, $68 million agency which consists of three divisions: law enforcement, communications and corrections, as well as the administration of the Monmouth County Police Academy and the Office of Emergency Management, which played the lead role in preparing for Superstorm Sandy and coordinating the response and recovery efforts during and after the storm. 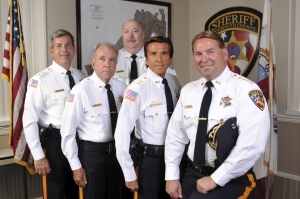 Sheriff Golden is a lifelong resident of Monmouth County and brings with him a wealth of experience in law enforcement and public administration with over 20 years’ experience in law enforcement as well as experience as an EMT, certified paramedic and volunteer firefighter. He holds a master’s degree in administration from Seton Hall University, is a NJ Certified Public Manager and an adjunct professor at Monmouth University with the Department of Political Science and Public Policy. The Sheriff has been instrumental in promoting shared services in Monmouth County, specifically through the expansion of the Communications Division, to cost effectively address the ever increasing needs of Monmouth County’s first responders. Sheriff Golden is the president of the Constitutional Officer’s Association of New Jersey (COANJ), is a member of the Board of Trustees for the Monmouth-Ocean Foundation for Children (MOFFC), sits on the board of the Monmouth County Prevention Coalition and serves as chairman of the Monmouth Council of Boy Scouts Exploring Committee. In 2013 Sheriff Golden received the Maurice Pollak Award for Distinguished Community Service from Monmouth University. Under his leadership, the Sheriff’s Office offers over 28 community safety programs throughout the county and has partnered with Neptune High School in establishing Explorer Post #1 at Neptune High School for the Jump Start Law/Criminal Justice students as well as partnering with Neptune for the annual Sheriff Youth Week program.